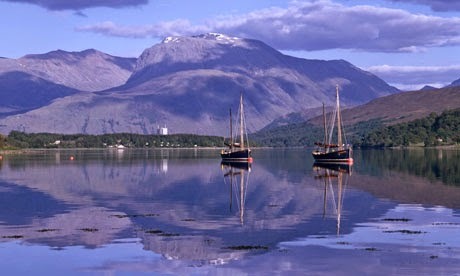 Ben Nevis, photo courtesy of the Guardian. I often find myself wondering why events separated by decades of time and great distances can have such a profound effect on the way you continue to look at the world, even to the point of defining who you really are so many years later. A good example is the assassination of John F. Kennedy on November 22, 1963, in Dallas, Texas. I was 10 years old at the time and living thousands of miles away in a small, isolated village in the Scottish Highlands. The village lies under the shadow of Ben Nevis, the highest mountain both in Scotland and within the rest of the British Isles. What I particularly well remember was not the shocking event itself but the reaction of my father. The time was late evening and I was in bed sleeping. Suddenly I was awakened by my father standing silhouetted against the open bedroom door. "The president's been assassinated!" he blurted out. I looked at him and he looked at me and although there was barely any light in the room, I was somehow aware of the shocked expression on his face. A moment or two later he turned around and walked out the room. That was it. Within seconds I was fast asleep once more. Funny thing is I've never forgotten the moment. Was it the assassination itself, or the profound sense of shock on my father's face, something I'd never seen before, which has stayed with me ever since? Probably the latter. It was only over the next day or two while watching television that I began to slowly realise how momentous an event the death of JFK really was. And that realisation only grew stronger with each passing year. Just over a year earlier there had been the Cuban Missile Crisis, of course, in which for almost two weeks during October, the whole world held its breath as civilisation teetered on the brink of possible nuclear war. Even although I was a year younger at the time, I still had a feeling something was very wrong although I didn't know what. My parents were acting strangely, tense and often distant, talking in hushed, quiet tones. I didn't really have the sense to ask them what was going on. They wouldn't have told me even if I had. At that time I didn't listen to the radio, read newspapers or watch very much television. So I had no idea at all. But that strange atmosphere in the house could be felt everywhere. Tension seemed to be etched onto every passing face. Then, one day, everything returned to normal. Everyone, including my parents, was laughing and smiling once more and the strange atmosphere hanging over everything simply vanished into the cold autumn air. I suppose it was from that point onwards I began to take a greater interest in what was going on around me. I watched more television, particularly the news, even although much of it simply sailed over my head. Then one day, quite by accident, as I passed the television set which had been left switched on, I watched a man speaking to tens of thousands of people about a dream that he had. Sitting alone in the living room listening to him, the tingles ran up and down my spine rooting me to the spot. I was mesmerised. I'd never heard anything like this before. That man was Martin Luther King Jr., the leader of the U.S. Civil Rights Movement in America. Even although I didn't understand what was going on, his words touched my very soul and changed me forever. And his words have been with me, guiding me, ever since. Thank you Jay for your wonderful comment. I had a read of your blog and I must admit I admire your courage and fortitude greatly. My thoughts are with you. Wishing you all the very best.